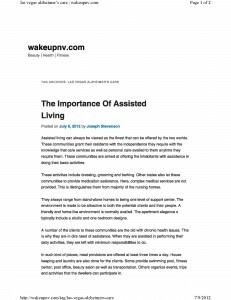 The Article The Importance of Assisted Living Original article text in black Our comments- non bold, italics Assisted Living can always be viewed as the finest that can be offered by the two worlds. What are the two worlds he is talking about in line one? It is implied in this statement that all of ones’ care needs can be met in an Assisted Living Facility. Of course, maintaining independence is the “best world”, no matter what the setting. Unfortunately, when most people consider Assisted Living they are already in need of some amount “care” or assistance. The reality is that as you age, your care needs and the amount of assistance you need to function will increase. Which is why, it is not the structural facility that is truly important, but it is the system of caregiving and coordination of care that is offered at a facility that is the most crucial factor. It is the ease and reliability of receiving care you need when it is needed. These communities grant their residents with the independence they require with the knowledge that care services as well as person care availed to them anytime they require them. These communities are aimed at offering the inhabitants with assistance in doing their basic activities. This, in fact, is not entirely true. Generally, Assisted Living facilities are geared to independent people who want a hotel type environment and have very minimal care needs. They offer levels of extra assistance for personal care, like bathing and dressing, at an extra cost and the assistance needs to be scheduled or planned for in advance. After the scheduled assistance is provided, the resident is largely on their own. If you need help in-between the scheduled times, you have to be able to go somewhere and ask for help. Even then you might not get the help you need right away. There may not be someone available to assist you at the time you need them. If you are independent enough to search someone out to assist you, then you probably do not have a high need for personal care. For people who do have a need for assistance with personal care, then it would be much more difficult to search someone out and actually receive the assisted care you need. For example, a resident with incontinence ideally would require a under garment or brief change every 2 to 3 hours to prevent skin breakdown and infections. This type of personal care assistance is difficult to schedule in advance and can become very expensive as the number of interactions and assistance with personal care increase. Often when people move in they are largely independent and is not until the need for more personal care arises, that they can actually see what is available, from whom, and when. It is very difficult to know in advance when you will need assistance. Residential Care Homes offer an alternative type of care and setting in which the service and personal care is offered in more of a family like/home setting with assistance and supervision 24 hrs. a day, on an as needed basis. The care is more of a friend or mother standing by type of care wince the building is smaller and the staff is constantly around the residents. This is what we call Family-Style care. The cost of residential care homes are usually inclusive of all services and care provided. Assisted Living Facilities tend to offer A La Cart Care, at an additional price, where the care is provided according to the pre -arranged schedule. These activities include dressing, grooming and bathing. Other states also let these communities to provide medication assistance. Here, complex medical services are not provided. This distinguishes them from majority of the nursing homes. Some Assisted Living Facilities do provide a basic level of medication management at an extra cost, with only one or two trained and certified medication techs. In general, residents go to the medication room to get mediations so that the one med tech is in the med room in case someone wants an as needed medication. At times Medications are dispensed at meal times. When the one Med Tech goes out to find a resident in the big facility the medication room is often times left unstaffed making it hard for the other residents to get medications. With only one or two med techs for 50 to 100 residents, it may be difficult to locate the med tech when you need them. Consider the size and complexity of the building, the number of floors and wings of the building. It can be a very large area to cover when looking for someone. For more independent people that system works fine, but as you need more help that service might be harder for disabled, older, persons to utilize. In residential Care homes, usually all of the caregivers are trained to give medications. With fewer total residents, it is easy to see that access to the med tech and getting your medications is likely to be easier especially if you are not totally independent and unable to hunt down the med tech. They always range from stand-alone homes to being one level of support center. The environment is made to be attractive to both the potential clients and their people. A friendly and home-like environment is normally availed. The apartment elegance typically included a studio and one bedroom designs. 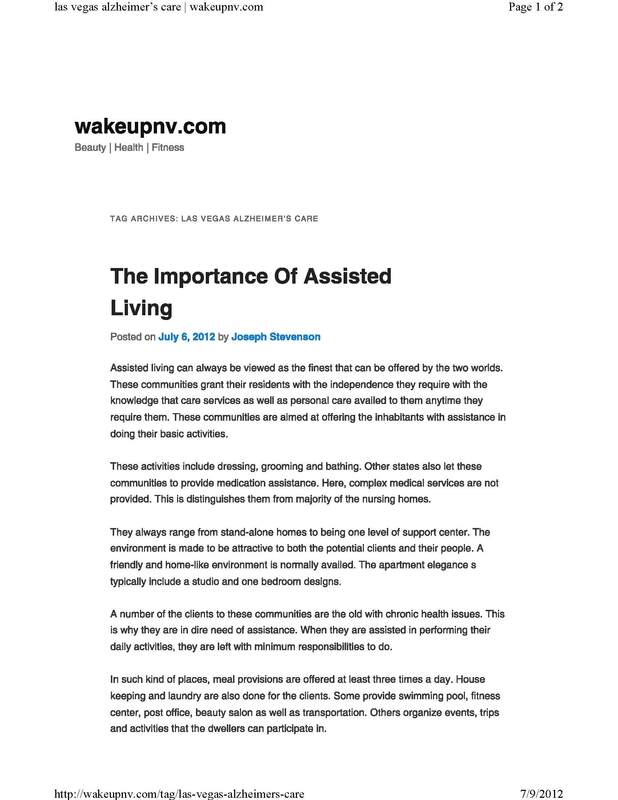 Assisted Living Facilities are not stand alone homes. They usually offer studio or 1 bedroom apartments in an enormous building with 50 to 150 residents. This does provide highly functional, independent residents with the privacy accorded with ones’ own living space. On the other hand, it also may contribute to isolation and loneliness for residents who are not as independent and functional. In contrast, Residential Care Homes provide care in a residential home that has a real family like feel, where there can be a higher level of supervision and interaction. The staff or caregivers are usually trained in many disciplines, including medication management. Also, the ratio of administrators, med techs and caregivers to residents is much higher in Residential Care Homes which means it is likely will have better access to the more skilled people in the care team. For Example, if there is one administrator overseeing 50-150 residents in a large, multi-floor Assisted Living Facility, Compared to one administrator for 10 or fewer residents in a smaller Residential Care Home it is more likely the administrator in the smaller Residential Care Home will know your name and see you on a regular basis. The interaction and contact with the administrator is important because the administrator is the boss, the person responsible for coordinating the staff and ensuring the staff are trained to provide the care. With a smaller resident to administrator/staff ratio the administrator is more likely to have hands on approach which leads to better continuity of care and personal interaction from the administrator and the staff they train or supervise. A number of the clients to these communities are the old with chronic health issues. This is why they are in dire need of assistance. When they are assisted in preforming their daily activities, they are left with minimum responsibilities to do. As stated earlier, Assisted Living Facilities are geared to more independent seniors, offering minimal assistance with personal care at an extra cost. Often Assisted Living facilities are not set up provided higher levels of assistance that one may need as their chronic health issues worsen. Assisted living often has a limited staff of 2-3 caregivers serving 50 or more residents. Covering such a large building, often with two floors and different wings, is a significant task to supervise. In order for 3 caregivers to provide assistance to 50 residents, each care giver must assist approximately 16 residents. Therefore, the caregivers have limited time to spend with each resident and are put on a tight schedule to meet the scheduled tasks. Unfortunately, caregivers may just complete the task of a shower or dressing, to save time and stay on schedule. In many cases, it would be a bigger benefit for the resident if the caregivers encouraged the residents to do the things they are able to for themselves, even if it takes longer like buttoning there shirt. Most seniors prefer to do it themselves and they take as long as need to do it. The residents usually don’t have a high need to do it quickly. The senior has all day and wants to fill the day up with productive things like doing their own personal care. It is easy to see why staff /caregivers need to go quickly, but for seniors may feel more empowered, more in control, if the caregiver had taken he time to let the resident do more for themselves. The notion of providing assistance with daily activities for a resident and thus, leaving them minimal responsibility for their own care causes pause. It is during this time of increasing need and decreasing function that senior residents want to maintain as much control over their own care and do as much care as they can for themselves. If they want assistance they want to ask for and direct it. It is important for caregivers to encourage seniors to participate in their own care, even if it takes them longer. Allowing seniors to remain in control and participate in their own care might be a better goal than doing the task for them to save on time and stay on schedule. Clearly seniors want the responsibility and suggesting it is somehow better to take the responsibility away from them is somewhat concerning for this writer. In such kind of places, meal provision are offered at least three times a day. Housekeeping and laundry are also done for the clients. Some provide swimming pool, fitness center, post office, beauty salon as well as transportation. Others organize events, trips and activities that the dwellers can participate in. Meal preparation, Housekeeping and Laundry services are hotel style services and are not what most consider as “care”. We believe that “care” and “Assistance” are highly interpersonal, people related services, and are quite different from the less personal housekeeping and Laundry Services. Assisted living should let the inhabitants gracefully grow old. This is so since the necessary support is easily accessible or if not, they have the responsibility of contacting other care offering agencies. This keeps the inhabitants in the society as the level of support rises. 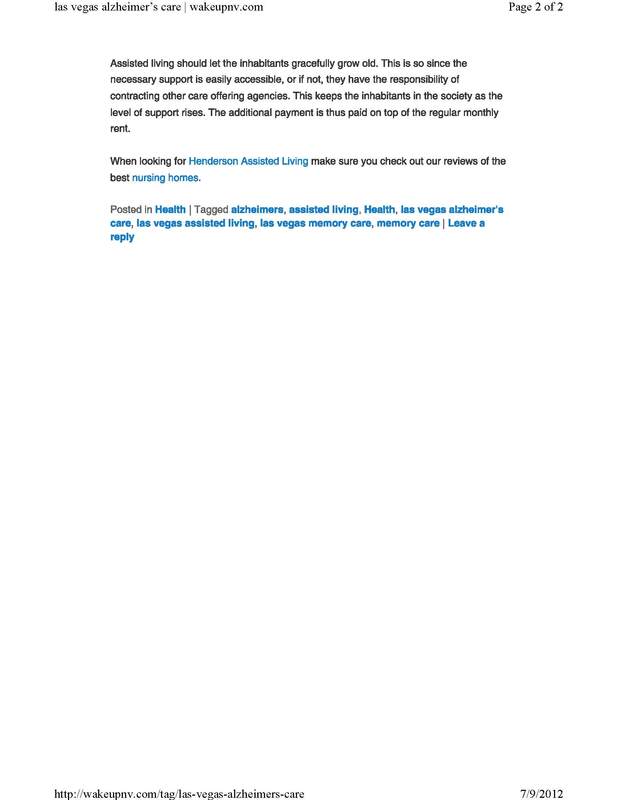 The additional payment is thus paid on top of the regular monthly rent. The important thing to note here is that in an assisted living environment, it may be difficult to grow old gracefully if you have medical problems or chronic conditions. Be wary of places that outsource care to other agencies or say “if we can’t do it, we can get an outside agency to offer the care you need.” This is an enormous additional cost to the resident. In addition, delegating the responsibility of providing care does not support the idea of continuity of care. Personal commitment and responsibility of Facility and Residential Care Home owners, administrator and staff is essential to a frail aging senior with many medical problems. When looking for Henderson Assisted Living make sure you check out our reviews of the best nursing homes. 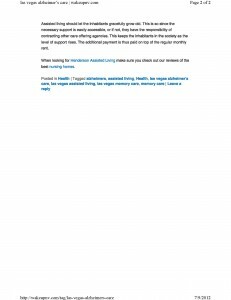 Posted in Health Tagged alzheimers, assisted living, health, las vegas alzheimers’s care, las vegas assisted living, las vegas memory care, memory care Leave a reply.